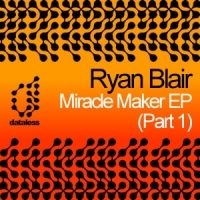 Up next on Dataless we have yet another high quality release lined up in the form of two part EP from rising Northern Irish starlet Ryan Blair. Ryan has already started to make some very big waves in the music industry with a remix for none other than Lisa Lashes as well as a release on Ali Wilson's Tekelec label so we're very pleased to have him on board! 'Miracle Maker' is available now from Beatport and iTunes.